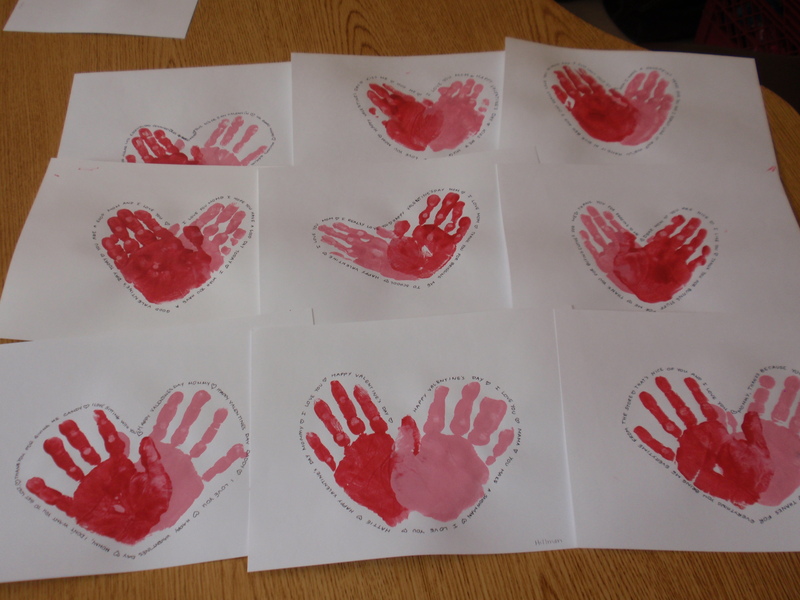 We made the heart handprints, and they turned out wonderfully. We started making them on Monday, but even the ones we did Tuesday dried quickly enough to be able to write down the children’s quotes for their mothers, and send them home that day. I used cardstock for the paper, which made the handprints look nicer, I think. I had a plate of pink paint, and one of red, and used a wide paintbrush to paint the children’s hands. One hand was pink, then I held the hand to make a print with it (I figured letting the kids do it alone would result in lots of smudging), and then I painted the other hand red and did the same thing. For the quotes, I wrote little hearts between the sentences instead of using periods. 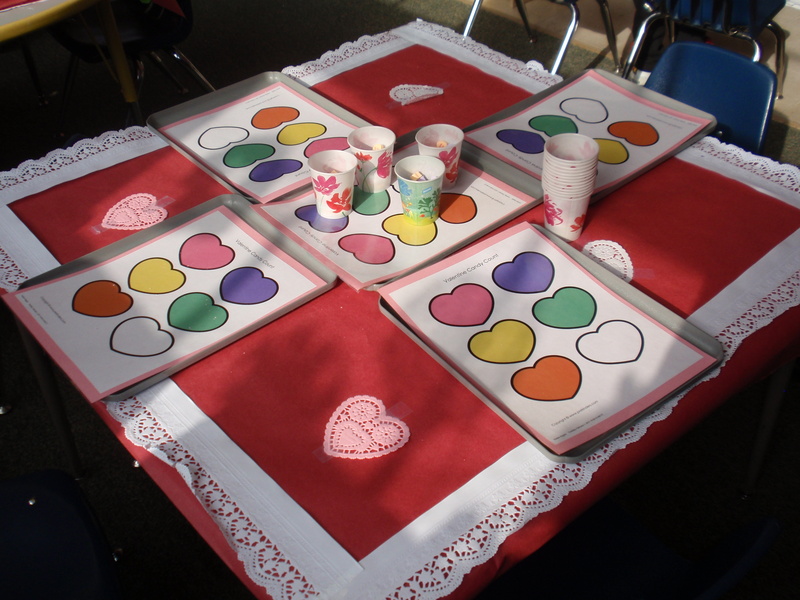 During the party, one table was set up with laminated cards for sorting candy hearts by color. After the kids sorted the hearts, they got to eat them. Yum! 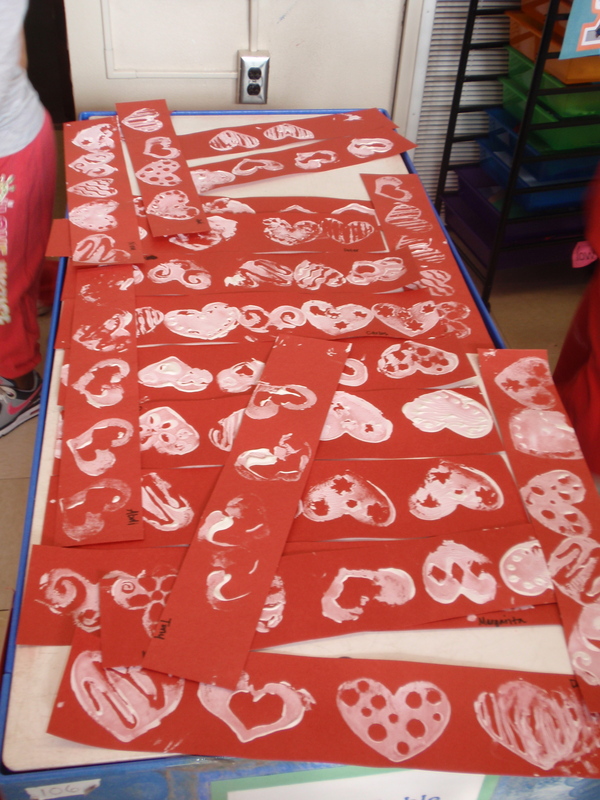 At one table we used heart stamps that I bought from Oriental Trading to dip into white paint for stamping. When the red strips were dry, we used them to make hats for everyone. 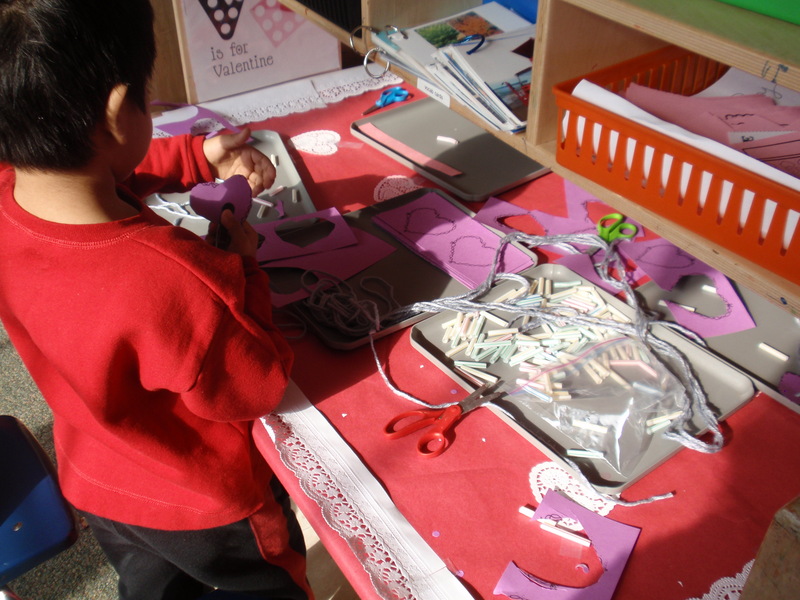 At another center, we used cut-up straws as beads, and hole-punched paper hearts twice to string necklaces. Aw…looks like so much fun!!! Was the little one there today? You know, the one who was going to hide in the bathtub? Good bless his little soul. Ok, I just reread that post. I have no idea why I thought he said he was going to hide in the tub. I see now that he was going to hide in his room. Either way, it made me tear up again just reading it. We (my assistant, my Americorps volunteer, and I) were all so depressed and exhausted this week. We made things fun for the kids, but it was a long hard slog. It’s awful that I can’t do more for this child, but I can’t. I can only make school a safe and loving place. Have you heard anything about the CPS investigation? In my state they have 24 hours to respond but I must say that in a case like this our county people would have been there within a couple of hours. Nothing has happened that I know about, but CPS is under no obligation to tell the school what action, if any, they are taking. What does the quote around the heart say? This is adorable!